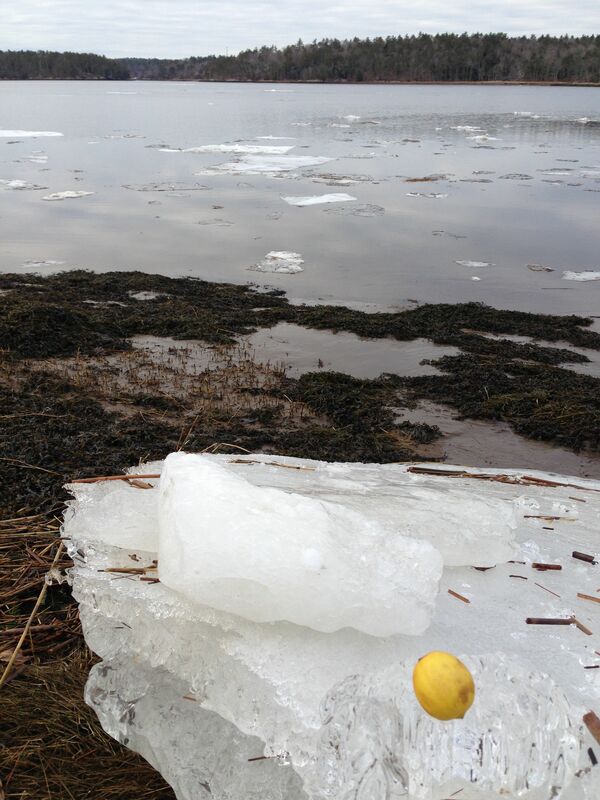 This is one of my limes at a friend’s house in Maine. But it’s feeling very cold here in Oakland even. Frost warnings at night. What’s a citrus farmer supposed to do? Wrap my trees, that’s what. Whenever I hear the temps will be in the low 30s, I drape the citrus trees with floating row cover aka Agribon aka Remay. This acts like a jacket for the tree–the spun poly fibers raise the temperature around the tree by almost 5 degrees. Now, the other thing to do is to spray the plant with water. To us mammals, this sounds like an insane survival strategy. To understand how it works note that water has three phases: ice, water, and stream. To get ice to melt takes energy, just like it takes energy to make water boil. When water is going through a phase change, energy is given off. As water freezes into ice, heat is actually given off. A hydrated plant then, will be a warmer plant. If you love ’em, cover ’em. Speaking of fruit, the Golden Gate chapter of the scion exchange is happening this weekend! Saturday, 12-3 at Ed Roberts Campus in Berkeley by the Ashby BART. http://www.crfg.org/chapters/golden_gate/scionex.htm. If you’ve never been, get ready for a fruit-seeking thrill like no other. This entry was posted in fruit trees. Bookmark the permalink. I live in North Texas, so all of my citrus trees (I have six) are in pots. When the danger of the first frost is imminent, all six go marching into my garage, one car gets dispossessed, and the gro-lights go on. And from Mid-November until the end of February, that’s where they stay. As soon as the first blossoms appear on the trees, I know they’ll be going outside in a couple of weeks. And in the meantime, I enjoy the fragrance of their flowers every time I sashay into the garage. We always have a few late ripening lemons left on the trees when I banish them to the garage, so there’s the other advantage of close proximity….this works on my Meyers, kumquats, limes and my new favorites, the Lemon Drop lemons (they’re a cross between a Meyer and a kumquat). From what I understand, global warming is affecting the jet stream, and the way it held most of the Arctic air in the north is changing. This means that more Arctic air is falling southward; a climatic shift producing weather changes–like Sandy and the recent blizzard that got started in Texas and didn’t blow out until Newfoundland. Even here in Canada the weather is becoming more extreme this winter. Here on the Saanich Peninsula we live in an extraordinary Mediterranean-like micro-climate, but the changes are going to make our food supply even more unstable. I see where Australia is being hit with a heat wave taking temperatures to the mid fifties (that translates into the high 120s on the Fahrenheit scale). I can’t imagine trying to grow food in temperatures like that. Hopefully we’ll see you at the scion exchange! Tom and I will be manning the EBUAA table. Luckily, I only have four apple trees in my yard that need worrying over. Hope to have a lemon tree this year! The ground here is about as fertile as my grandmother….it groans at the prospect of trying to grow anything. My avacado trees are in pots on wheels so I can move them in and out as the weather permits. Luckily, my geese, two ducks and assorted chickens are doing well in this weather. Hope to add a few turkey poults and guineas this year (neighbor dogs wiped out my flock) to help keep my Nigerian Dwarf dairy goats company. I am from El Cerrito originally, but now live in Alabama (long story). It is a free, yahoo group, where you can connect with other fruit tree enthusiasts, and swap genetics of hundreds, if not thousands of varieties of all different kinds of fruit. Hope to see you there!!! When I looked at that photo it looked so much like home. Surprise it is. We have a lot of that plus frozen over bays right now but the days are getting longer and it is still a little light at 5pm now. We’re gaining. I am not actually commenting about this blog post but I had a couple questions. My name is Eliza and I want to ask for some advice. You might remember that I am the one that won the awesome cheese book. I actually wanted to get a goat because 1. they are one of the best animals in the world, 2. I want to be closer to what I eat, and 3. because I think that it would be such a great experience for me. I have wanted a goat from when I was about three but we actually live on the stanford campus and we aren’t zoned for them. I was just wondering if 1. you were zoned for all of the different animals you have had and 2. if you think I could pull it off even if they aren’t legal and 3. if you think that I couldn’t pull it off what could I do to still get a goat. I loved Farm City–stayed up until 3 am last night (OK, 2 am–it was Daylight Savings changeover night) reading it. If you can find old-fashioned (i.e. tiny incandescent, not LEDs) Xmas lights, a string of them under your citrus tree wrap will keep the tree nice and warm. We’ve had a long string of freezing nights here in western Sonoma county, and I have them on a photocell that turns them on at dusk, off at dawn.